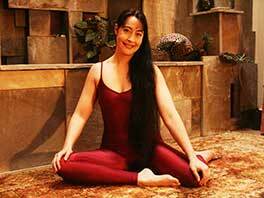 TriYoga®, founded by Kali Ray, is a complete hatha yoga method. In the TriYoga Flows, breath (pranayama) and focus (mudra) are united with flowing and sustained postures (asana) in systematized sequences. TriYoga fundamentals include relaxation-in-action, wavelike spinal movements and economy of motion. At first, the flows warm-up the body gradually, then deepen into more intense strengthening and stretching poses, followed by a cooling-down period of gentler postures and deep relaxation. Several different levels and series of TriYoga Flows from Basics to advanced allow students of all ages and backgrounds to systematically progress to greater states of fitness, health and relaxation in a safe and therapeutic way. With the systematic approach, students can remain with Basics or continue to Level 1 and subsequent levels. Within each level, students increase their knowledge of posture and flow, as well as strength, flexibility, endurance and breath control. Through sustained awareness on all aspects of the practice, the movement of the body, breath and mudra harmonize and the inner flow naturally emerges. For those new to TriYoga and for those who want to strengthen their core alignments, Basics is the necessary foundation for all levels. It is also a complete practice in itself. Bolsters, pillows and other props can be used in all levels to ensure comfort and alignment.